This traditional recipe for Russian beef stroganoff or govjadina po Strogonovski or bef stroganov needs little time cooking because it's made with beef tenderloin, also known as filet mignon. While it is fully accepted that this dish is always made with thin slices of tender beef, like tenderloin or top loin, and onions, there is debate as to whether mushrooms are traditional. American versions always include them. In the States and Russian-American restaurants, beef stroganoff is typically served with egg noodles or rice pilaf, but crispy pan-fried potatoes are the traditional Russian way to serve stroganoff. What is unchanged, whether American or Russian, is the sour-cream sauce accompanying the beef. Season beef tenderloin strips with salt and pepper and set aside. In a large saucepan, sauté onions in butter until translucent. Add mushrooms and sauté about 2 minutes or until collapsed. Add reserved beef strips and sauté for 5 minutes. Stir in flour. In a small bowl or measuring cup, mix together beef stock with dry mustard and tomato paste until well blended and pour into the pan. Bring to a boil, reduce heat, and simmer on low for no more than 15 minutes (or until beef is to your liking). Temper sour cream with a few ladles of hot cooking liquid. If using wine, add it to the sour cream. Return tempered mixture to pan and heat through until thickened. Adjust seasonings and serve with pan-fried potatoes, sliced pickles and more sour cream on the side. 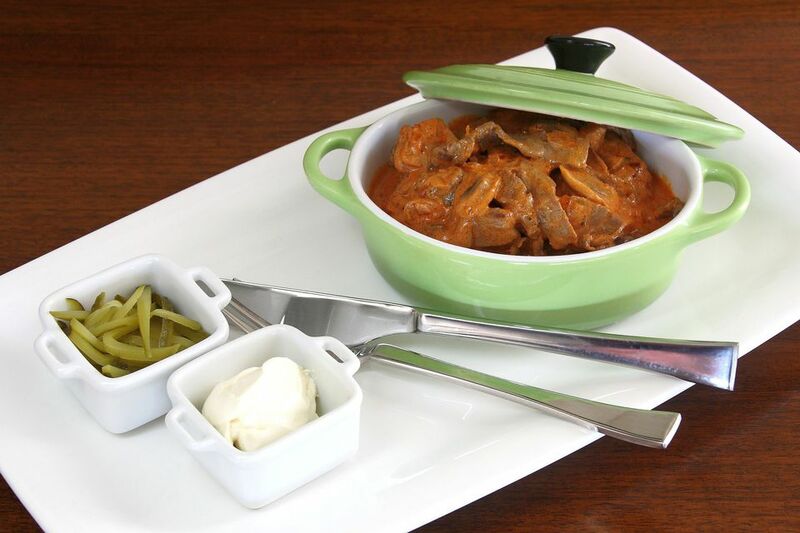 The dish originated in Russia in the 19th century and is said to have been named after a member of the large and important Stroganov family, perhaps Alexander Grigorievich Stroganoff or Count Pavel Stroganov. Variations on this traditional beef stroganoff recipe include using cooked and drained ground beef that has been sautéed with onions and mushrooms in place of beef tenderloin slices. The meat mixture is then combined with a sauce of sour cream and beef broth and poured over cooked egg noodles to create a tasty comfort-food casserole.